Guess what tiny human is hoppin’ into tiny tanks for 2016? Me. That’s who. CB. And boy, am I gosh diggity dang excited. My secret not-so-secret is I actually already have experience with Tiny Tanks. Due to space limitations, I drained an old 20 gal and swapped it for a 2 gallon shrimp tank about two years back. 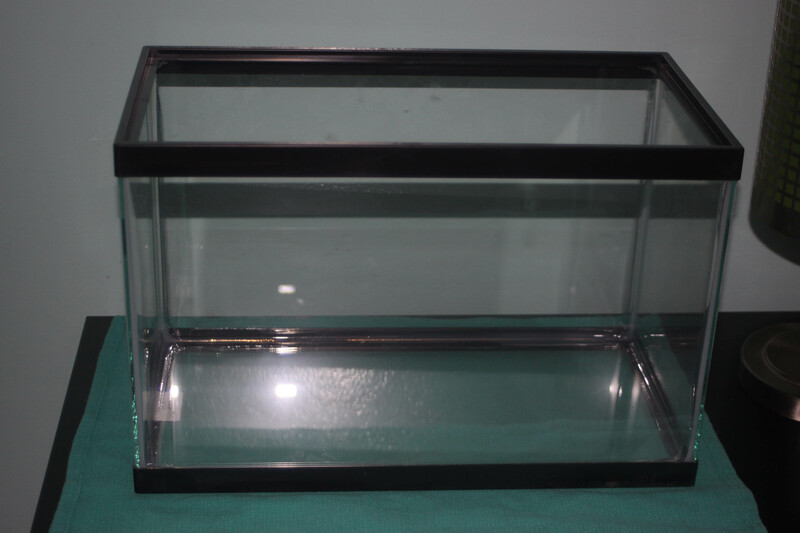 I’ve also got a fluval spec III 2.8 gallon hanging out on my desk for a couple months now that I’ve been using for excess plant storage since its betta tenant died, so this challenge is a good excuse to get it back on track. Marvel at my algae bloom excess plants. My super nerdy and very loose inspiration is That Forest in That Movie. “That Movie” is also called Princess Mononoke. I plan to accomplish this obviously-achievable-in-real-life-cartoon-forest look by using old java moss that I’ve been keeping in a critter carrier for a duration of time that is estimated to be approximately-Too-Long, and tying it down the the everloving surface of everything. And also maybe tie a plant on some driftwood to make a tree. Who really knows at this point, not me, because I’m a professional*. I’m only purchasing a couple new things for this challenge, namely a new light which I got yesterday, and hopefully a nice piece of driftwood if I can find one that fits in just the way I want. The rest are recycled supplies, but I’ll go ahead and list them anyway with rounded up prices that I got them for when I got them! Exception is plants, which I took from my old tank and had grown from some pretty sad ones that I took off a friend’s hands years back, so those fellas cost me nothin’. So if you also want to use plants I highly suggest you make friends with people who have some and take theirs because you love them. -GRAVEL, $5 I’ll be using plants that feed from the water column as opposed to substrate, so no need to start with a rich substrate. No link because it’s just some rocks. Total is sitting at $65. No filter being purchased on this one because the spec has a very overpowered unit already built in. So that’s it before I drain the thing and actually start. Join me next time as I drown a naughty piece of driftwood for days before throwing it in, and try to decide on what critters to stick in here. Probably a betta, because I like them and the tank is already modded to accommodate one. Definitely some cherry or ghost shrimp, because I like them even more. This is my old fish. This fish is dead now. Maybe I will get another just like him, but less dead. I thought I’d give a little more detail on my #tinytankchallenge project. Like Ethan, I will be using a “standard” 2.5-gallon tank. Unlike Ethan, I will be creating a freshwater biotope aquarium using plants and fish from the White Cloud Mountain area of China. White Cloud Mountain is the type location (the place where a species is first found) for the White Cloud Mountain minnow (Tanichthys albonubes), my feature species. White Cloud Mountain Minnow, Tanichthys albonubes. Photo by sannse. This file is licensed under the Creative Commons Attribution-Share Alike 3.0 Unported license. A biotope aquarium, as I mentioned in my previous post, is an aquarium that uses livestock and design elements from a specific geographic region. This can be as precise as only choosing plants and fish from a particular spot in a particular stream, or as general as using plants and fish from the same watershed, or even just the same country-of-origin. As far as equipment goes, I’ll be using a 2.5-gallon tank I had on hand for another project that never came to fruition. I’m happy to put it to good use here! I will not be using a lid so I can maximize the light reaching the plants. I’m using a fine gravel substrate that I purchased when it went on clearance ages ago. At the time, I think I may have paid a dollar for the bag, but a five-pound bag of this kind of gravel typically runs around $5 or so. Plants prefer a finer grain, and I’ve done really well growing all sorts of rooted plants in this type of gravel. I do realize that this isn’t “plant substrate”, but I’ve had good success using this less expensive gravel and occasionally supplementing with root tab-type fertilizer pellets. Filtration will be provided by a small hang-on-back filter that I’ll actually hang on the side of the tank to create a nice current. This will mimic the flow found in sluggish streams, similar to the ones in which White Cloud minnows live. The filter cost $22.50 at an LFS (local fish store). I will use this small LED light bar to light the tank. The LED light cost $19.99. This tank light has a number of benefits: it’s very bright, it has a small size, and therefore it doesn’t use much power. One negative feature is that it IS so small, so I may end up getting something else. Updates to come! 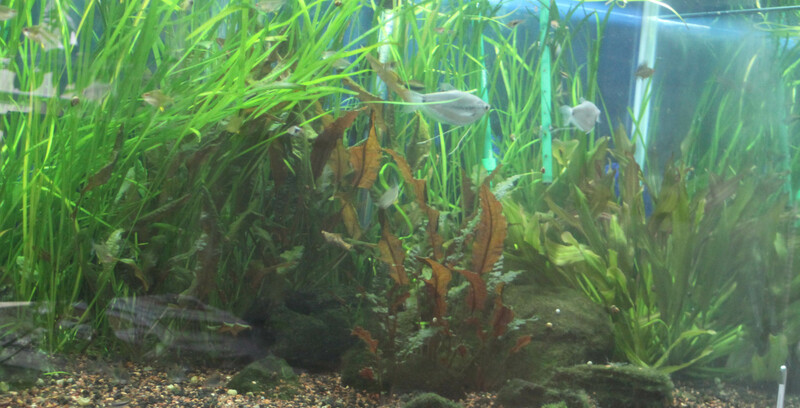 The tank won’t need a heater, since the plants and fish all come from cool-water habitats. So that’s where I’m at coming up to the beginning of the year. Next steps include rinsing the gravel of dust, research into the species of plants found in the type location, locating those plants for purchase, and starting the cycling process in the tank itself.